Meet the women's version of world's best-selling t-shirt! 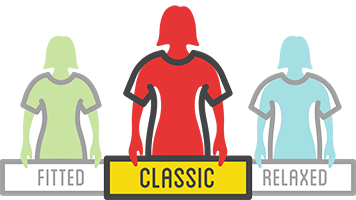 Consistent quality, colors, sizing and availability over several decades have made this Gildan tee the perennial champion. The hearty 6-ounce fabric is comfortable and durable with a vast assortment of colors to satisfy all. The Gildan Printed Women's Classic Ultra Cotton Tee features a slightly open crew neck and a subtle taper in the cut. Like its men's counterpart, this tee is the industry standard as well as an excellent value. *Heather grey is 90% cotton/10% polyester.